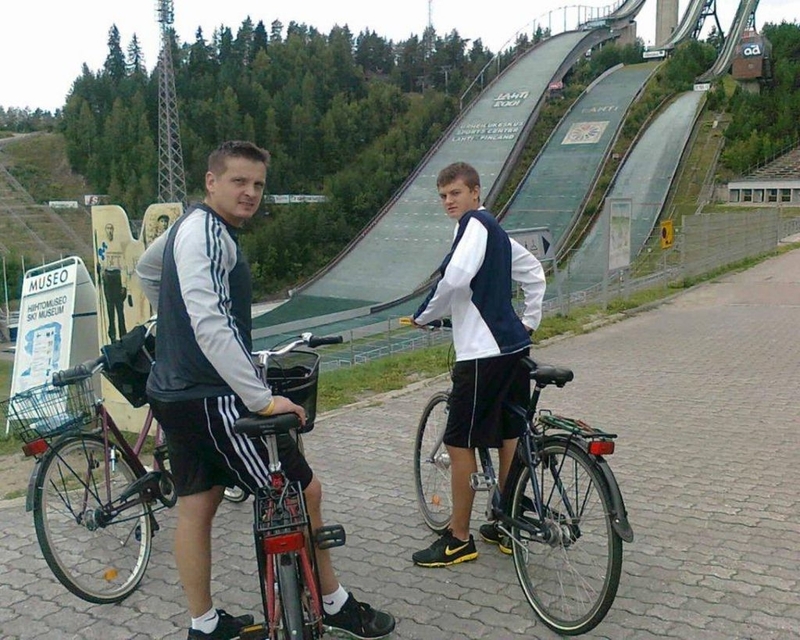 Janne Kivihalme and son Teemu biked in Finland this summer. Twenty-one years ago, Janne Kivihalme came to the U.S. as an exchange student from Finland. It didn't really matter where. He just wanted to learn the English language in North America. "And the best way to learn is to go to a country you're forced to speak the language," said Kivihalme, who was positioned at Superior High School in Wisconsin, where he played hockey his senior year. Kivihalme didn't get to choose his location, but in the end, it turned out to be a great fit. He has never permanently left the Midwest. The former defenseman for Oulun Karpat of Finland's SM-Liiga, one of the best hockey leagues in Europe, went on to play college hockey at Minnesota Duluth and the University of Wisconsin-Superior, where he graduated. Now entering his sixth year as head coach at Burnsville High School, Janne is one of the state's rising stars behind the bench. A product of the Finnish system, Janne grew up playing in his hometown of Oulu, a city of about 140,000 in central Finland. The focus there was on honing skills and overall athleticism through more practices and dry-land training. While the U.S. has gravitated toward that recently, there is still the North American style, described as more physical. Now, with a strong base of playing and coaching experience in America, he's taken bits and pieces from each development style and made it into his own. The results for Burnsville have been positive. Janne, whose late father, Jaakko, also played for Oulun Karpat, takes an active role in the youth program and has built some contending varsity squads, including last season's South Suburban Conference champions. Janne's son, Teemu, was a defenseman on that team. He posted three goals and 11 assists for the Blaze as a freshman and has become one of the state's top blue-liners at his age. Like his father, Teemu is a puck-moving, offensive-minded defenseman who likes to join the rush. Unlike his father, Teemu grew up here and is much more Americanized than Janne. Dad has put forth a lot of effort in teaching and exposing Teemu to the family heritage. Some fish, potatoes, vegetables and other traditional grub consistently make their way to the dinner table. "Oh yeah, a couple times a week," Teemu said. "They love fish." But more notably, both father and son travel to Finland every summer to vacation, see family, take Finnish saunas and play a variety of different sports. And, of course, they fish. The past two summers, Teemu has been skating with Finland's U16 and U17 national teams. As a result, he possesses dual citizenship. The playing experience has exposed him to high levels of international hockey that should pay dividends for the underclassman. "It was good playing against a different culture, different players. It's not like U.S.A. players," said Teemu, who's also played baseball, lacrosse, tennis, badminton and soccer. "Some of those guys don't really check as much as U.S.A. players. They're faster. They use Olympic sheets so they have to be faster and quicker." Janne has coached Teemu through the youth system at Minnetonka and now at the varsity level in Burnsville. He describes his son as a product of both Finnish and American hockey. "I'm used to him being on the bench, doing his thing," Teemu said. Janne will continue doing his thing starting this week. Tryouts for the Blaze begin Monday.